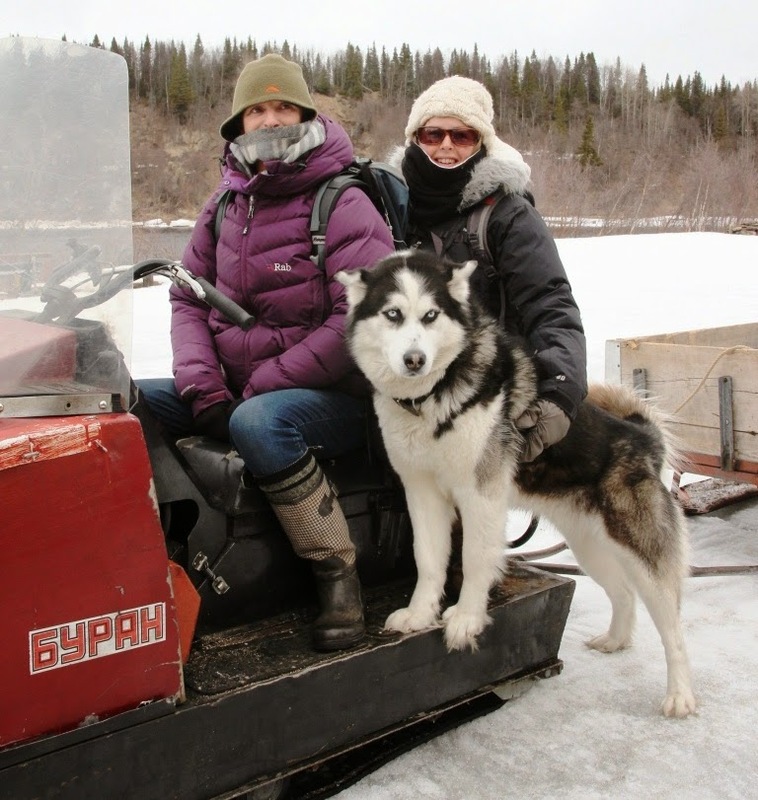 Normally Sasha and I would have driven back to Murmansk yesterday; to top up on any last supplies and kit needed, then to meet our first guests this morning. It is a huge frustration for all of us here, and of course the fishers at home, that we remain locked in ice and snow. 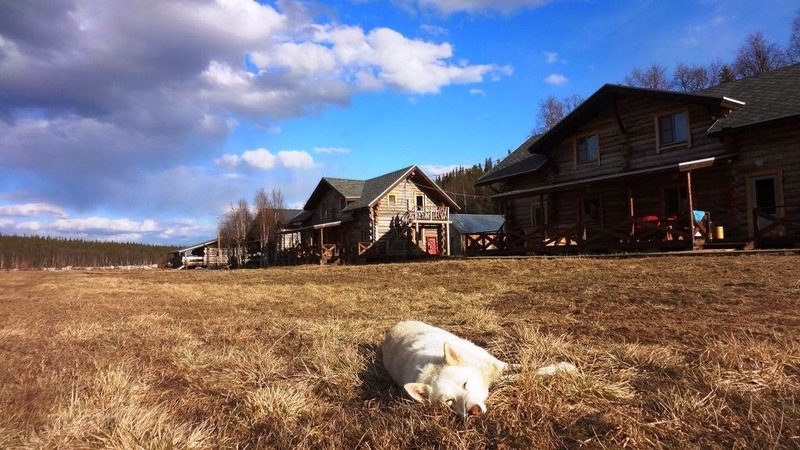 I recalled the scene last year and dug out the photo I took of Kari enjoying the spring sunshine on 9 May. 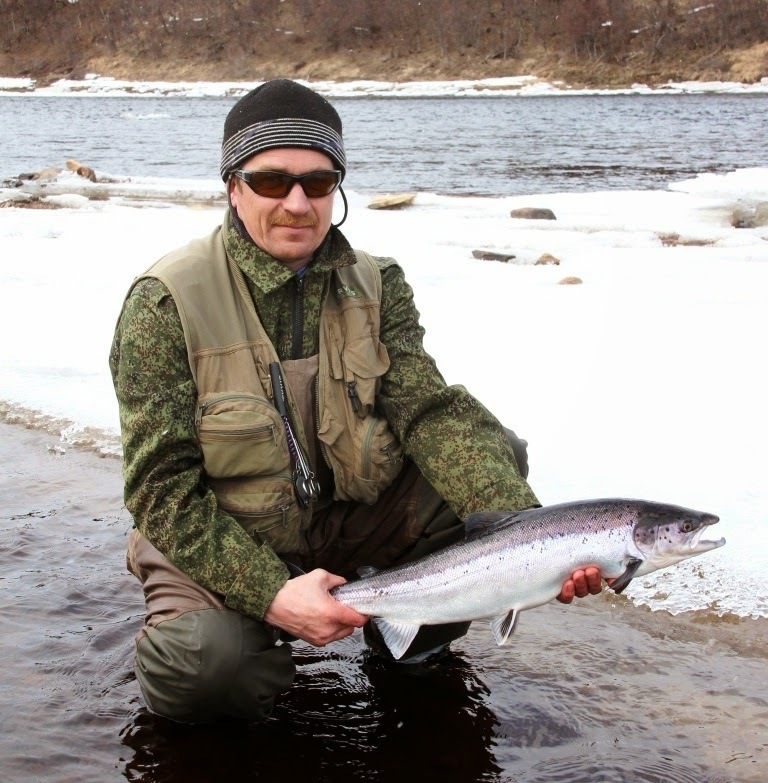 The river was clear, a perfect height, and we were really looking forward to seeing our first guests. Yes – we had sunshine yesterday, but with a bitterly cold wind - and although you could feel the sun if you found shelter in the wind you had to really muffle up. It was Victory Day, celebrating as I mentioned last year an important day in the Russia view of the world, the Soviet defeat of Fascism with the cost of 20 million lives. A big National Holiday and once we had finished our tasks here in camp the girls walked up to a party in the village. Their ordered walk on departure, stamping careful steps along the river bank around the softer and slightly treacherous ice berg fields, was in contrast to the return which might be described as somewhat disorderly. In any event all returned safely if not exactly gracefully – the Russian hospitality here is wonderfully generous. 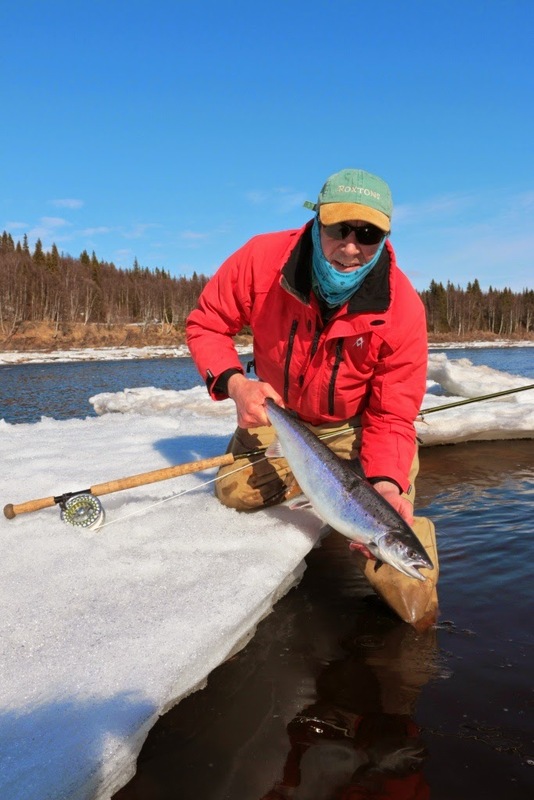 I took the chance for my first cast this year, the water was up an inch or two and had started to get some colour in it with grass and sediment kicked up by the chunks of ice coming down. 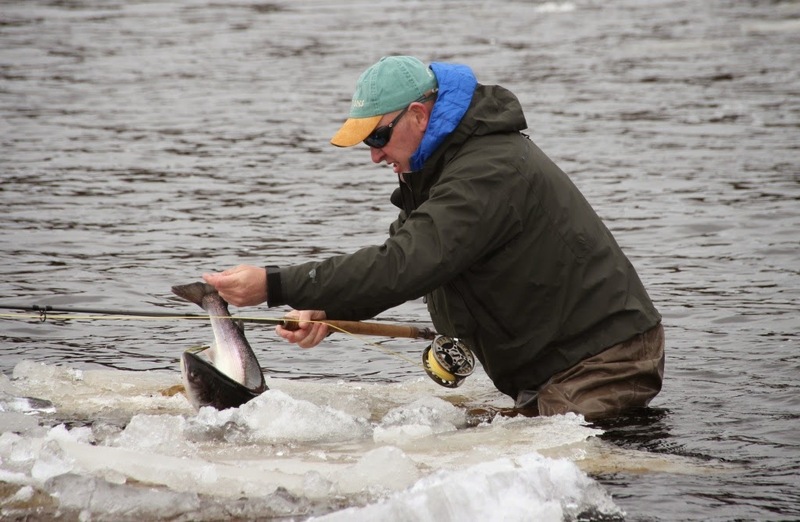 That looked encouraging from the melt point of view, but the fish seemed to be off – but I guess that is all relative such is the quality of the fishing here, and in 20 minutes I had my first springer and was glad to be out of the 1⁰C water. 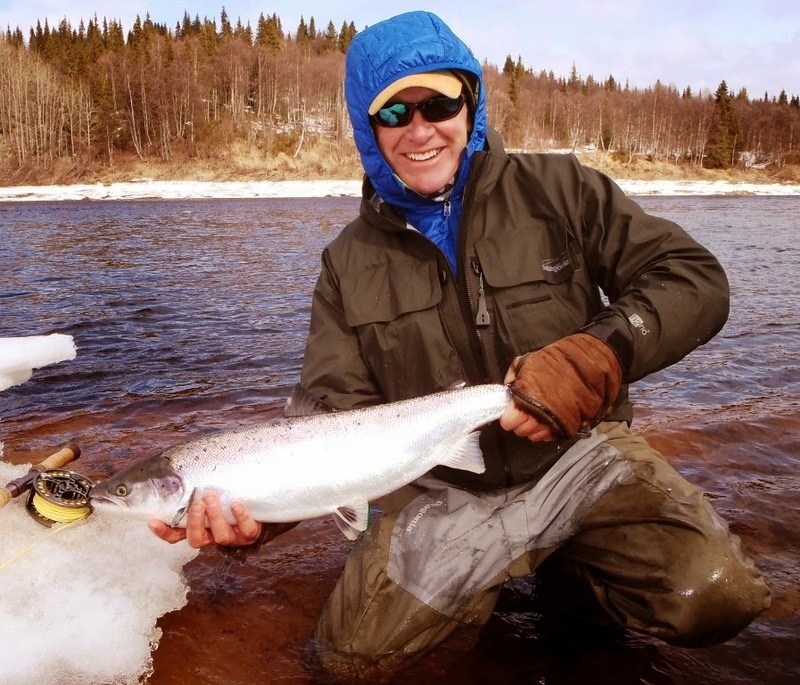 So, above is the first photo in five years of yours truly with a salmon. It is a touch milder this morning, I’m typing this in the office, with its view over the river, and can see an encouraging, steady stream of drips from the snow on the roof. The forecast continues to predict warmer weather tomorrow and rain which, I hope, should start the proper melt. By tradition the journey for our team into Varzuga from Murmansk starts at 10 p.m. on a Sunday night with a glass of Russian champagne, served I fear in a plastic pic-nic mug. Always a great re-union and made more memorable by the surreal, chilly, windy car-park setting. Tiffy and I came out on 1st May to complete the supply lists and load up the lorry bound for the village, and thence out to the airport for the above ceremony. 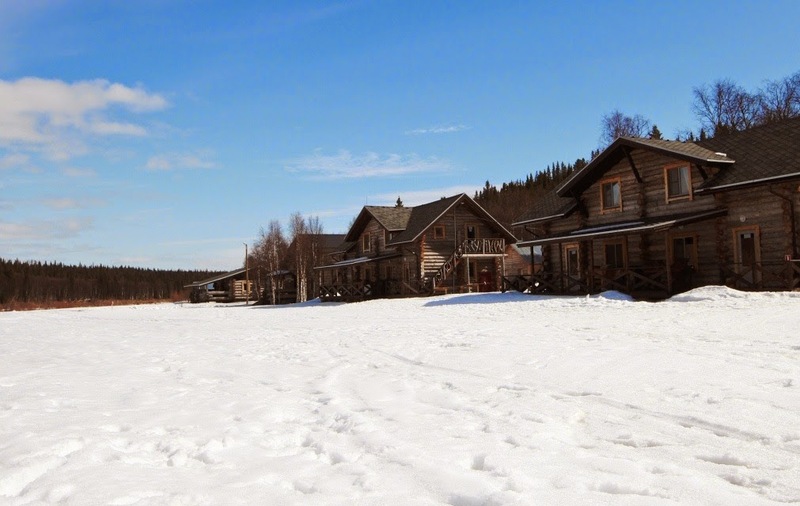 We normally stop for a few hours sleep at Umba and then head on down the road to Varzuga village. 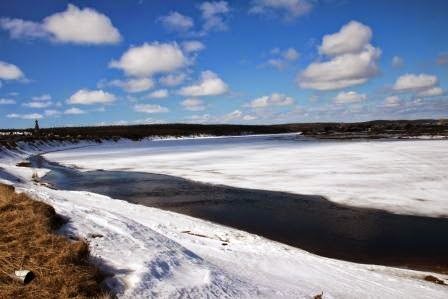 With the river still frozen this year, and after a long journey, we used the skidoos to ferry all the bags and kit in and stretched our legs over the crisp snow down the river bank to camp under a bitter but bright sky. There was more snow on the ground than I expected, and after the warm spell of mid April much of it is now rock hard and semi-ice rather than snow. Getting into our containers is always a top priority and a certain amount of digging and cursing was required. 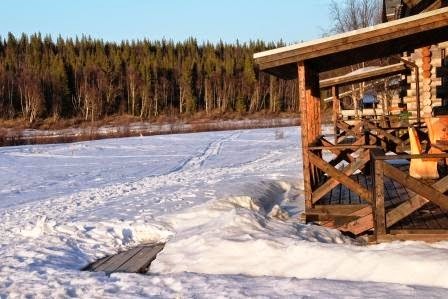 On Tuesday we moved the rest of the stores down from the village to camp, again on sledges behind skidoos. 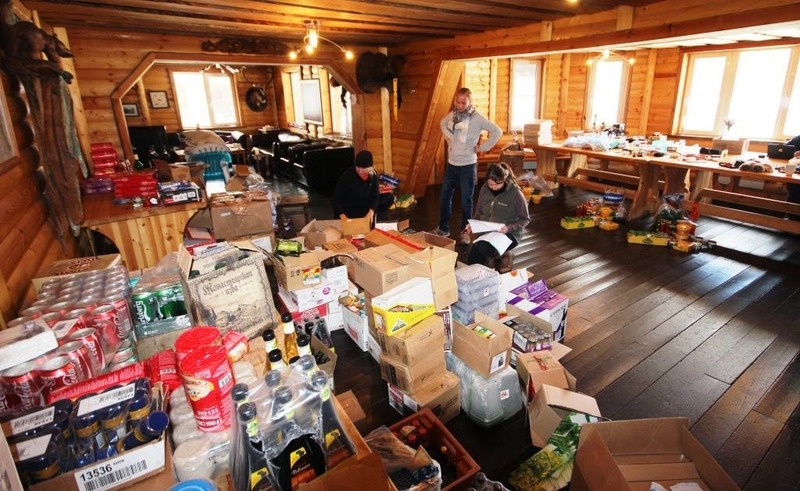 Tiffy, Donna and Maryke then set about dividing a season’s worth of supplies between the four camps while Bill and Terry sorted out the boxes of new waders, boots and jackets for the guides, kindly supplied by Colin Thomas at Airflo. By last night all was pretty well boxed up, labelled and ready for dispatch and a well deserved party was had; all seem a bit slower this morning and I suspect it is self-help for breakfast. Yesterday was grey and cold, the air temperature hardly got to 0⁰C and apart from the odd bit of ice breaking off there was no change in the river to report. A good day to be inside doing ‘admin’. Without any sun the drips from the melting snow off the roof were almost non-existent. The only hint of things to come were the two ravens who nest opposite here at Lower Camp, they arrived in the morning and flew up and down the river croaking in that unmistakable way so reminiscent of wild places. Good to see them again, as always they arrive almost to the day every year whatever the conditions. 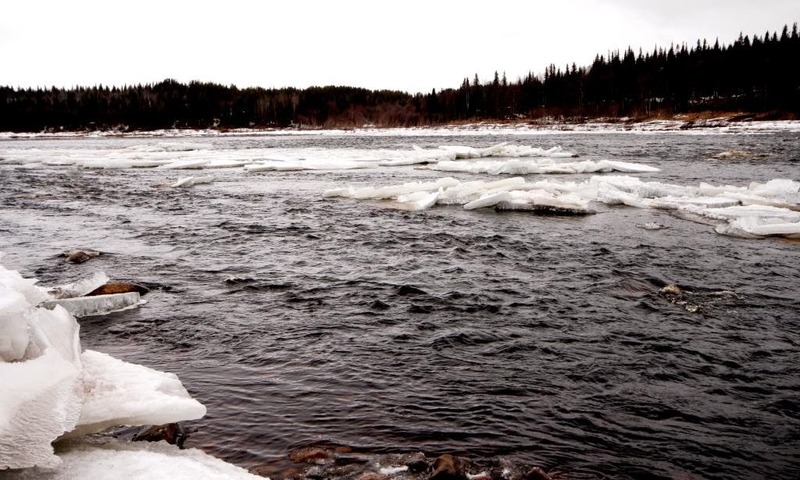 Below is a photo taken this morning of the rapids right outside the office, ice stuck everywhere in the shrunken river. 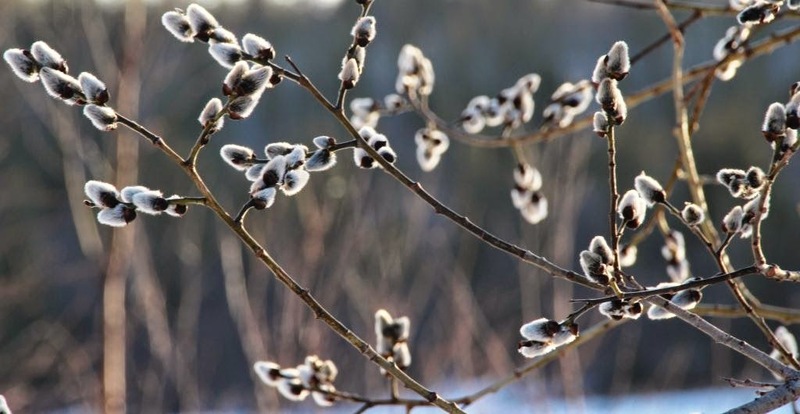 The forecast continues to predict an end to this freeze at the weekend. I’ll update you tomorrow and, with much work done, I suspect Bill and Terry will get a chance to fish in the limited clear water we have.